The ISP division of Fusion Network Services Corporation, FUSION GOL, (HO: Chiyoda-ku, Tokyo; CEO: Hiromi Imakoga) offers for use on a public Alpha trial release of a new Web-based desktop system named "StartForce", starting from May 11. 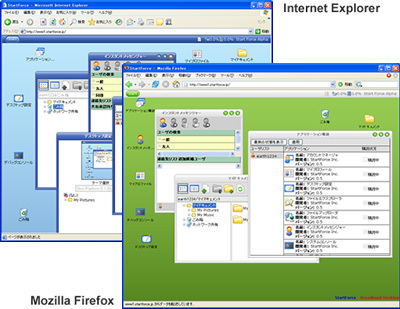 The alpha release not only includes the basic features of a personal computer operating system (document creation and image viewing etc. ), but also comes equipped with services such as (1) file storage (2) file sharing, and (3) instant messaging capabilities. With the alpha release, we invite developers to design and build innovative applications on StartForce platform and help us to introduce this new realm of the Internet and familiarize the public with the power of AJAX. At FUSION GOL, we hope to implement a new business model aided by StartForce. For end users, StartForce is the "Broadband Desktop" with a collection of growing Web 2.0 application accessible from anywhere within a browser and an Internet connection. For developers, StartForce is the Web 2.0 platform for development and distribution of Web 2.0 application. For ISPs, StartForce enables rich, productive, and differentiated broadband services for subscribers. For PC makers, StartForce creates new a "software as service" business model for personal computers. Together, StartForce is championing the innovation of Web 2.0 revolution worldwide. We are very committed in making our partner Fusion GOL successful in driving adoptions of Web2.0 in the Japanese market. On this significant occasion, through FUSION GOL, it’s our great pleasure to introduce Start Force to Japanese market. FUSION GOL [Fusion Network Services Corp., GOL Division] in accordance with the IP-Phone pioneer, Fusion Communications Corporation’s concept of "Everything over IP", FUSION GOL provides broadband services offering a wide variety of benefits. Technological innovation and bilingual support by our international staff is what sustains our reputation as a trustworthy ISP.. Refer to http://www.gol.com/en/biz/ for details.